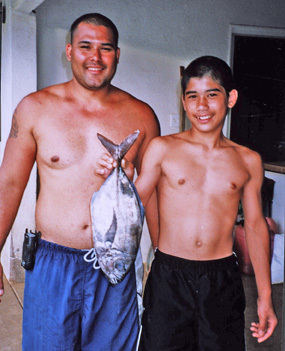 Brad De Rego was teaching his son Kekoa how to handle a Penn Jigmaster when he noticed that they had a bite. He quickly handed the pole to Kekoa who fought the fish to shore where the line snagged in the rocks. Brad took over and freed the line and landed the fish. The unusual jack turned out to be a whitemouth jack or dobe papio. It made some 'ono sashimi and became a new state record at 2.98 lbs!